The toolchanger sensors detect the state the toolchanger is in so safe toolchanges can be performed. If the sensors fail or are misaligned, the toolchanger will freeze. Lock out power from the spindle, but leave the machine enabled. Unscrew the sensor clamp, remove the sensor and test it in Setup->diagnostics by putting a piece of steel up to the tip and verifying response. 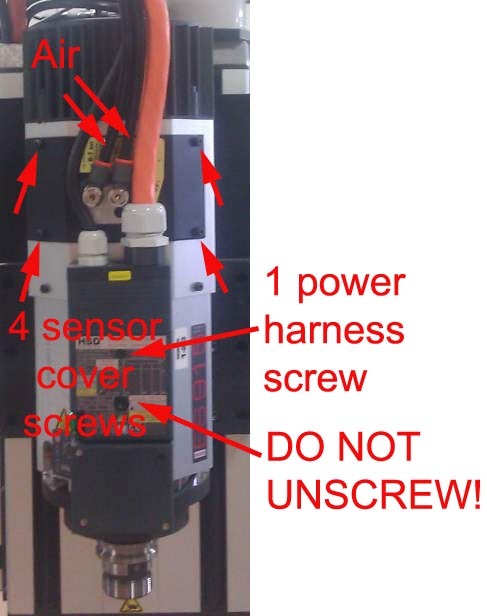 If there is no response on only one sensor and all other sensors work properly, the sensor likely needs to be replaced. Contact HSD USA to obtain a replacement. If the sensor checks out properly in diagnostics, it is probably just misaligned in the housing. Notice how the sensor body is not concentric with the holder body. As you rotate the sensor in the spindle, the position of the sensor will change. While watching diagnostics, rotate the sensor until the proper response is obtained, then tighten down the sensor. 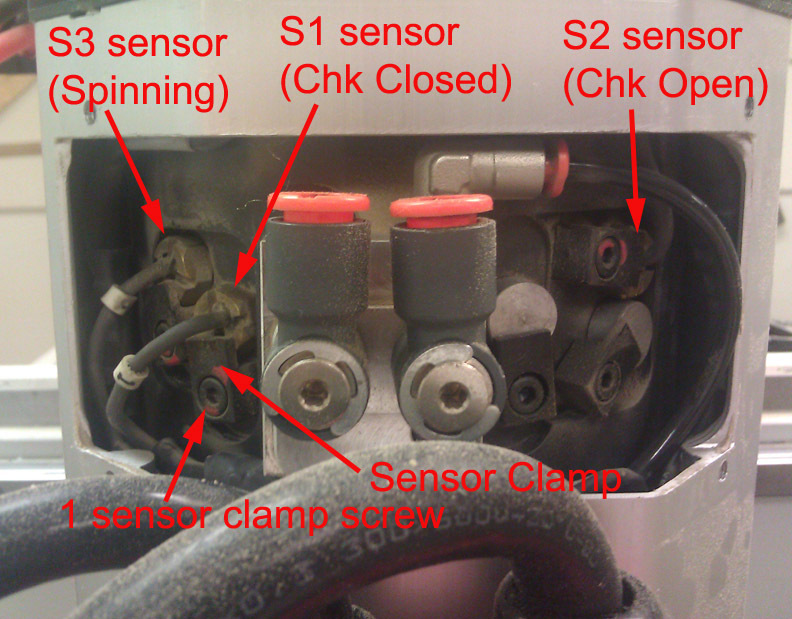 Note that the spindle must be in the proper state (chuck open/closed) for the sensor to properly sense the state. 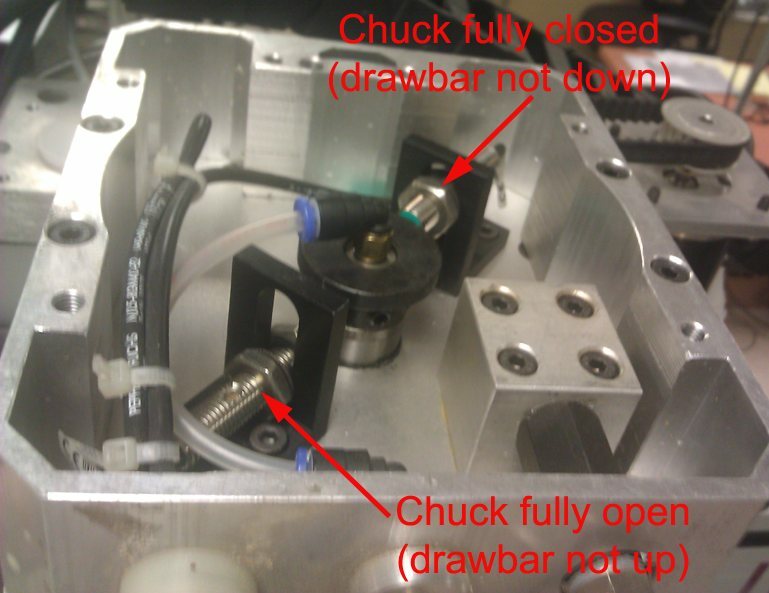 This means that if you are testing the chuck closed sensor, the chuck must be closed and there must be a tool in the chuck or the sensor will never trip, no matter how good it is or where it is located. Lock out power from the spindle, leave the machine enabled. Remove the 2 or 4 bolts from the top face (facing the sky) of the spindle. This exposes the chuck sensors. Exercise the chuck to see how the mushroom head moves upwards and downwards and trips the sensors. If the top sensor (closed) seems too high, there is possibly dust/other obstructions in the spindle. It should be cleaned -- moving the sensor is not an acceptable repair in this situation. Touch steel to the sensor and verify it responds in Setup->diagnostics. If there is no response on only one sensor and all other sensors work properly, the sensor likely needs to be replaced. Contact PDS Columbo to obtain a replacement.